1. ) Jump In a Lake! Lake Leatherwood City Park is home to the spring-fed Lake Leatherwood. 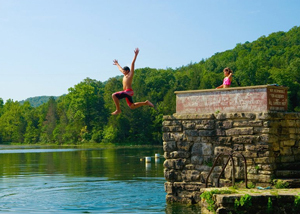 Always cool, this 85-acre lake is the perfect spot for you to take a dip. Always cool, Cosmic Cavern is one of the Ozarks prettiest caves. Visitors are lead on a tour that features two bottomless underground lakes, one with trout. The cave features a 9 foot soda straw the longest known in the Ozarks. One of the lakes was discovered in 1993 in the “Silent Splendor” section which made national news. After the sun goes down, huddle around the campfire to hear ghost stories of the Ozarks under the shadows of the Crescent Hotel. Flickering Tales ends with a midnight tour of Baker’s notorious Morgue in the hotel. It is guaranteed to spook you! 4.) Relax on a Cruise! 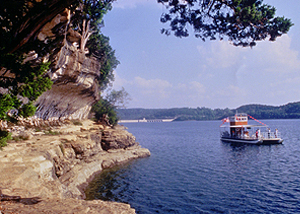 Hop on the Belle of the Ozarks for a 12-mile cruise on Beaver Lake. Informative narrative of lake history and attractions, including Beaver Dam. View over 60 miles of scenic shoreline. Cruise around a 200 acre wildlife preserve and see the Ozark Bluff Dwellers burial ground. Try Ozark Mountain Ziplines, 2 hour 100% tree-based adventure! This shaded, zip line canopy tour allows participants to experience a secluded outdoor adventure from high in the treetops. 10 zip lines, ranging from 120 to 1800 feet in length are suspended tree platforms. Take in beautiful long-range views of the Ozark Mountains from tree platforms and explore the forest from 20 feet to over 200 feet in the air! 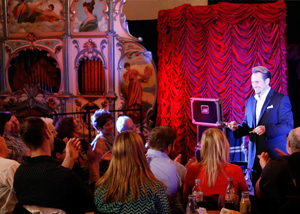 Travel Back to an age of Intrigue during the Victorian era and witness an evening of incredible and mysterious demonstrations performed by an Illusionist and a Medium in the beautiful, historic ( and air-conditioned)Gavioli Theater. Be amazed without breaking a sweat at the Intrigue Theater! This entry was posted on July 15, 2015 by service424 in Attractions, Crescent Hotel, Ghosts, History and tagged beaver lake, Belle of the Ozarks, Cospmic Cavern, Crescent Hotel, Flickering Tales, Intrigue Theater, Lake Leatherwood, swimming.